Apparently it’s in short supply. Seriously. An endangered species. I will admit. I am a tad bit OCD. Ok, a LOT OCD. But that’s beside the point. Kinda. I love ice. LOTS of it. I truly, physically, cannot drink a coke without LOTS of ice. It just tastes better ICE cold. 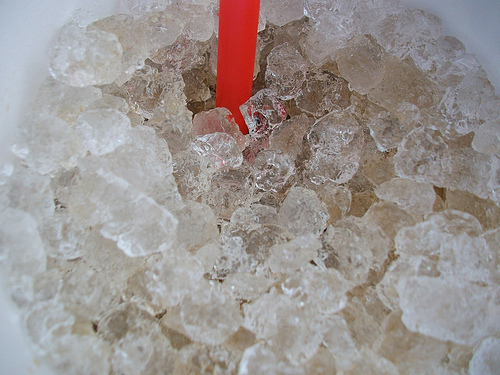 In my perfect world, I would pour an ICE cold drink into a cup overflowing with tightly packed ICE. But, then I realized that might be a tiny bit overboard to even attempt that order. I may be OCD, but people would look at me as if I were totally insane if I drove into the drive-thru and asked for an ICE cold Diet DP with extra extra ICE, please. And why bother? I have to fight tooth and nail as it is just to get a half a cup of ice with my super-size, 99 oz drink. Ok, it’s not 99 oz. But you get the picture. I don’t try to be difficult. In fact, I’m always extra nice. I always say please and thank you….even when the person really needs a swift kick in the bee-hind instead of thanks. So why, oh why, is it so hard to get that one, all important request? It’s just ICE!!! Tonight, I ordered as usual….. a Diet DP with lots of extra ice, please. I became so excited when the screen on the drive-thru actually said Xtra ICE. I just knew this was the day. I would actually GET my wish. Piles of icy lusciousness were awaiting me! I was so excited, felt so lucky, I even thought of stopping off and grabbing a lotto ticket. After all, this was my lucky day. First, ICE. Next, millions!! Wooooohooooo!!!!!! As I waited (for almost 20 minutes) in line waiting for that heavenly ICE-filled drink, I began to dream of the first things I would do with my millions. Of course, I would buy a HUGE ICE machine for the house…..the NEW house. The DREAM house. I began to recall all the images I saved on Pinterest of my ‘Just a Dream’ house. 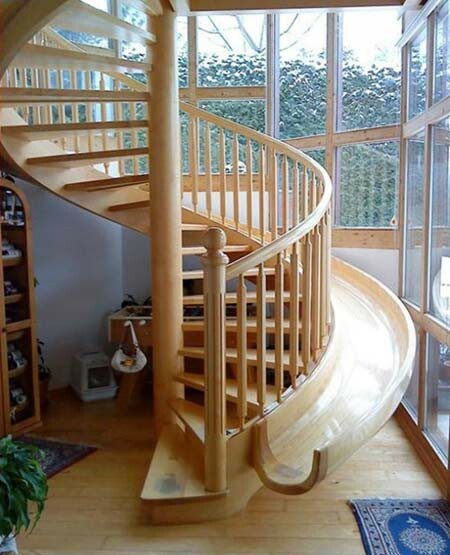 I was gonna have it all…….even a slide next to the staircase for the kids. Life was good. I turned up the radio. Sang at the top of my lungs. Who cared that others could hear me? This was MY lucky day. In fact, I might get picked up by a stranger who just happened to own a recording studio and make another million on that!! After all, what could possibly go wrong? The ICE gods had smiled on me and I was a happy girl. Finally, my turn came. My heart swelled in anticipation. I was going to savor this drink. Although I order the same thing the same way all the time, I rarely get my wish. 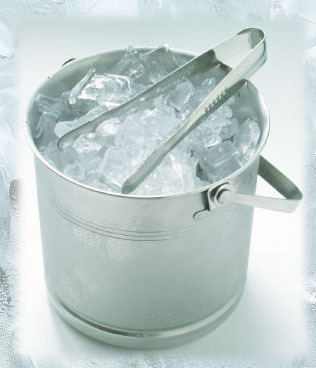 I usually have to ask for an extra cup of ice. I have even been told I would have to pay for the extra cup of ice. Like I said. It’s an endangered species. I rolled down my window, grinning from ear-to-ear. The gal in the window reaches out to hand me my drink. I’m not sure, but I’m afraid I might have even been drooling. I didn’t have time to check. I did find a suspect wet spot on my blouse after it was all over and my chin had a suspicious rash. Probably from the constant drool coupled with the occasional lip smacking. 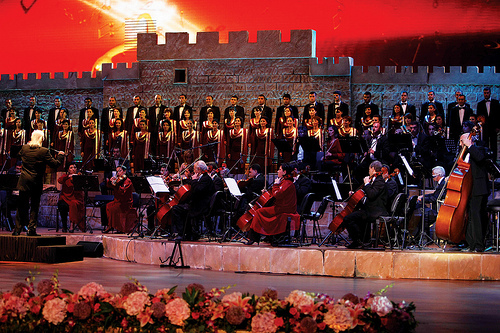 I can’t prove it, but I am certain the car behind me was carrying the New York Symphony Orchestra & Choir, because suddenly there was singing…. My eyes welled up with tears. Finally, someone had heard my plea. After years of begging for extra ICE, I actually was given what I ordered. Extra ICE. Without pulling up and re-fixing my drink myself by adding ice from the second cup, spilling it all over me, and wanting to curse. My life was good. No, my life was GREAT. And all it took was a little extra ice. And my husband says I’m high maintenance?! Ppssshhh!! The first hour or two of my morning can make or break my entire day. It’s akin to getting off on the right foot. Making a good impression. I am NOT a morning person. I don’t naturally jump out of the bed with a smile on my face. A smile from me in the morning must be earned. I so wish I was different, but I’m just not. I’m a grump. Which is why I have to get up earlier than the kids; so by the time I’m waking them up, the grumpiness has subsided. Even still, if I don’t start my morning off right, my day can be doomed to ‘the glass is half empty’ mentality. I have found starting my day off with time alone with God. Reading His word. Singing songs of praise to Him. Calling to Him in prayer. Changes my outlook. I know, I know, you have heard this over and over. Everybody says this. Maybe, like me, you are a grump in the mornings. You cherish and need your sleep. Your mornings are total, hectic; chaos. You are just doing good to get to school and work on time. I completely understand this reasoning because it was exactly what my answer was when presented with the morning quiet time idea. But even the Bible recognizes the importance of us being in touch with God each morning. 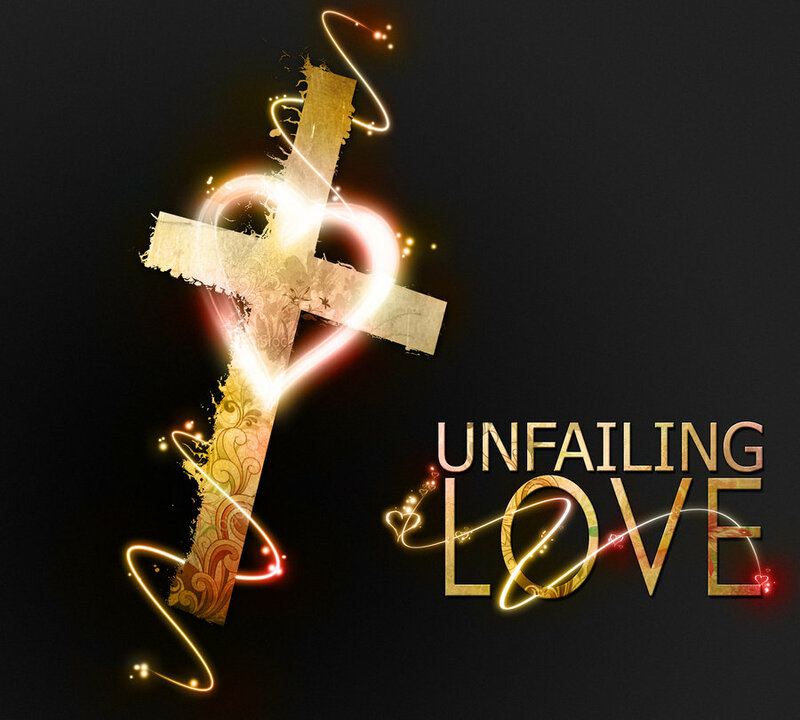 Our need to feel His love. His presence. Before starting our day. It changes your perspective. Once I finally gave in and tried it, I realized quickly, I cannot do without it. Starting my day off with God’s promises. His encouragement. It’s as necessary as brushing my teeth and combing my hair. It’s preparation of my soul for the day ahead. And some days are so hard, those words, those promises, just may be the only thing you have to cling to before the day is through. Starting your day off with the Almighty helps guide your steps. It shows obedience and dependence on Him. It allows you to draw your strength from him….first thing. Why wait until we are in a crisis to call to Him? That is not God’s plan for our relationship with Him. As Christians, we desperately need that time each day with God. So He can show us His way. His direction. 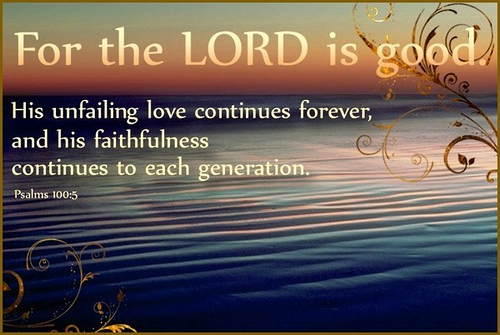 His love. Our journey is in vain if it’s not for Him. We are to give ourselves to Him. Not part of us. Not just on Sunday mornings. We are to give ALL of ourselves to Him. We are to lean on Him daily. Communicate with Him daily. Worship Him daily. “The experts” say it only takes 30 days to create a new habit. Why not start today? This morning, I challenge you to find time, no MAKE TIME to spend with God. Trust Him by giving yourself to Him. All of you. Spend time each morning meditating on His word. Speaking with Him in prayer. Turn on those worship songs and sing from your heart to Him. You will be surprised, even shocked, at the difference our God can make.